The United Nations (UN) serves many important purposes within the context of global governance. Thomas Weiss (2016) argues that as peoples and states become more interconnected, there is a need for more effective international management. He points to global issues such as terrorism, refugee movements, climate change, and economic crises as evidence for the need of international management. The Middle East is facing issues that encompass the entire aforementioned list, plus many others. The United Nations is subject to constant criticism from actors within the international community, be it from individual citizens, all forms of media platforms, or official governing bodies. Though sometimes UN criticism is valid and necessary, it is important to remember the contributions the UN has made in the Middle East. It is a fact that there is more that the UN could do to work towards regional stability and security in the Middle East. It is also a fact that the UN is operating under strained resources in highly complex issues that often involve power struggles among various external nations, which have geopolitical interests in the region. The UN is not a perfect system representing a global governing body. As an institution, the UN does what it can with what it has. This should never be forgotten nor taken for granted. Whether it is by supplying peacekeepers or providing developmental or humanitarian aid, the UN works to protect the lives of millions of people across the Middle East. Occasionally this is in the form of peacekeepers, but it can also be in the form of providing critically needed medical equipment, providing training for local residents in conflict zones to increase resilience, or providing education for children whose lives have been uprooted by conflict. The fact of the matter is that it is better to have the UN in whatever capacity is possible than not have the UN at all. The purpose of this chapter is to explore the UN’s contributions to peace and stability in the Middle East in the post-Cold War era. Utilizing the Middle East as a broad case study allows for a conceptual framework for how the UN operationalizes security. Moreover, the Middle East case helps us comprehend how the regional affects the global, as well as why interdependence matters. The traditional approach of peacekeeping in the Middle East has now evolved into an approach that also seeks to work towards regional security by emphasizing human security. This reframing has resulted in the UN supplying developmental and humanitarian aid in various ways. Though there are many examples in the Middle East that would support this development, this chapter focuses on Lebanon, Gaza and Israel, Iraq and ISIS, the Syrian civil war, and Yemen. Each section addresses the security concerns that currently exist and highlights what the UN is doing to alleviate them. The United Nations Interim Force in Lebanon (UNIFIL) has been present since its creation by the UN Security Council in March 1978 (UNIFIL Fact Sheet n.d.). Headquartered in Naqoura, southern Lebanon, the mission includes monitoring the cessation of hostilities, provides support to the Lebanese military, and provides humanitarian assistance to civilian populations (UNIFIL Fact Sheet n.d.). In April 2000, the Secretary General received official notice from the Government of Israel that outlined their plan to withdraw Israeli forces from Southern Lebanon (UNIFIL Background n.d.). Since then, a large role of the UNIFIL has been to monitor the border between Israel and Lebanon and report any violations perpetrated by either the Israeli Defense Forces (IDF) or the Lebanese military. The area monitored by UNIFIL is most commonly known as the Blue Line, which is a 120 kilometer stretch from Ras al-Naqoura in south-western Lebanon to Shab’a in south-eastern Lebanon (Pokharel 2016). The Lebanese Armed Forces (LAF) and UNIFIL coordinate with one another in order to ensure the security of the Blue Line – which faces numerous security concerns. The LAF and UNIFIL conduct joint military and training exercises, exchange experiences through a joint lecture program, and conduct checkpoints and patrols together (UNIFIL Operations n.d.). It is through these types of coordinated efforts that the UN has successfully implemented a long-term protective dimension in regard to security. UNIFIL regularly mediates tripartite meetings between senior officials of the LAF and IDF that serve as an essential method for addressing conflict management and building bridges and confidence between the parties (Tripartite 2017). UNIFIL has been largely successful at creating a positive relationship with the LAF that increases the physical security of the Blue Line and holds both sides accountable for any violations of mandates. Aside from engaging with the LAF, UNIFIL also recognizes the importance of engaging with the local populations. UNIFIL does this by informing local civilians of UNIFIL mandates and activities, providing assistance when possible, engaging with local culture, customs, and concerns, as well as actively participating in community events. Civilian Affairs and Civil Military Coordination serve as the main interface through which UNIFIL and local communities interact. Through these interfaces, UNIFIL is able to engage with government and community leaders, key religious figures, civil society groups, and international organizations that are involved with development initiatives. Creating a cohesive environment between UNIFIL and the local communities in which they carry out operations is a key aspect in maintaining security along the Blue Line. Understanding and engaging with local culture and activities provides a unique platform for UNIFIL to do this successfully. UNIFIL also provides free basic services to local populations, such as medical, dental, and veterinarian services. This helps to form a level of trust that is necessary for ensuring the security of the local populations as they deal with the day to day concerns that arise from being located in an area where personal security is a concern. The UN is also involved with the refugee population in Lebanon. Lebanon houses a large population of Syrian refugees that result from the ongoing war in Syria. The United Nations High Commissioner for Refugees (UNHCR) is tasked for addressing the needs of the refugee population in Lebanon, which is numbered around 1.5 million. The Syrian refugee population in Lebanon should be considered as highly vulnerable as large numbers deal with concerns over legal residency, which makes it difficult to work, send children to school, or receive health care. The concern over residency also prevents birth registration which puts tens of thousands of Syrian children born in Lebanon at risk of statelessness. This amounts to an increasing security concern both in the sense that vulnerable populations are not having basic needs met as well as vulnerable children not obtaining citizenship to any country. The residency issues Syrian refugees face creates a culture of fear and raises concerns of exploitation – such as labor exploitation and sexual abuse – as refugees with expired or no residency fear arrest by police (Human Rights Watch 2017). The UNHCR plays an active role in attempting to address the needs of Syrian refugees in Lebanon, but they are not able to address these with the necessary capacity. For example, in 2017 only 170,000 Syrian refugees received winterization support from the UNHCR (UNHCR n.d.). Refugees must endure harsh weather during the winter and become susceptible of freezing to death if basic needs are not met. The international community should take a more active role in providing funding for such basic needs to the UNHCR. Properly addressing basic human needs is a critical element to security as the population at hand is already vulnerable and susceptible to experiencing human rights abuses. Gaza represents a high security concern in the Middle East in terms of living conditions, economic stability, and protective security. It is an area that has experienced a high level of violence due to decades old conflict over territorial disputes. Hamas maintains control over Gaza – and the citizens of Gaza are often prevented from leaving due to Israeli and Egyptian border restrictions. Infrastructure has crumbled due to wars, artillery exchanges, and the lack of resources to fix them. Gaza is one of the primary humanitarian crises not only in the Middle East, but also in the world. The UN is present in Gaza and provides aid through various channels to citizens who need it. Yet, there are no peacekeeping forces in Gaza. According to the news agency Middle East Monitor, the Israeli government recommended the presence of UN peacekeepers in Gaza – but this proposal was rejected by Hamas (Memo 2017). Thus, the UN is only able to address security concerns in Gaza through a humanitarian approach and not a protective approach. The United Nations Office for the Coordination of Humanitarian Affairs (OCHA) is present in Gaza. This entity of the UN states that Palestinians living in Gaza are ‘locked in’ as they face harsh movement restrictions that have intensified since the takeover by Hamas in 2007 (OCHA n.d.). Ongoing tensions between Hamas and the Palestinian Authority (of the West Bank) have led to a dire humanitarian emergency that needs to be urgently addressed to avoid human casualties. In mid-April 2017, the power plant in Gaza stopped operating due to a dispute between Hamas and the Palestinian Authority regarding tax rates for the fuel used for the plant. The resulting fuel and power crisis in Gaza forced the shutdown of hospitals and prevented some citizens living in high-rise buildings access to drinking water. This crisis also transcends the security of the borders of Gaza as the lack of energy to treat raw sewage causes approximately 110 liters of poorly treated sewage to flow into the Mediterranean Sea on a daily basis (OCHA 2017). Tensions in Gaza have recently reignited, particularly after the United States announced it would move its Embassy to Jerusalem. Beginning in March 2018, Palestinians in Gaza began demonstrating in “the Great March of Return” to mark al-Nakba, or the Catastrophe, in which Palestinians commemorate the mass displacement that occurred due to the war in 1948–49. The demonstrations, continuing every Friday, resulted in mass violence on 14 May, when at least 60 people were killed and more than 1,300 were injured. Israeli forces used live ammunition, rubber bullets, and tear gas against demonstrators who had assembled along the Gaza–Israel border fence (UN News). The disproportionate use of force against protesters, the majority of which were unarmed, has been condemned. UN Special Coordinator Nickolay Mladenov briefed the Security Council and called for the violence in Gaza to end with the support of the international community, claiming the support would be essential in order to prevent war (UN News 2018). US Ambassador Nikki Haley spoke regarding the matter, claiming that the US Embassy move to Jerusalem reflected “the reality” that it has been the capital of Israel since the founding of the state (UN News 2018). She also claimed that there would be no plausible peace agreement in which Jerusalem was not the capital of Israel – ignoring the fact that predecessors had the negotiation of Jerusalem as a contingent matter of any peace agreement. It is clear that the UN has a vital role to play in the future of Gaza and Israel. As long as Gaza and Israel continue their tense relationship, the UN needs to continue its active presence. With potential conflict looming, the UN needs to be as proactive as possible in gaining support from the international community to pressure all parties from committing acts of violence and to work towards a peaceful resolution. The United Nations Assistance Mission for Iraq (UNAMI) is one of the primary representations of the UN in Iraq. Established in 2003, and greatly expanded in 2007, it remains active today. The UNAMI has a goal that is centered around assisting both the government and people of Iraq and are responsible for numerous initiatives that are critical to promoting increased levels of security. They work with the government and civil society to coordinate humanitarian efforts for UN agencies, funds and programs across the country. The UNAMI does not deliver humanitarian or development programs, but rather it raises the profile for development by engaging in things such as political dialogue, assisting in electoral processes, and facilitating regional dialogue between Iraq and its neighbors. The UN’s role in Iraq is heavily focused on the political realm and humanitarian aid – principally on the refugee or displaced persons population that has grown in the wake of the Islamic State of Iraq and Syria (ISIS). ISIS has occupied territory in Iraq and Syria since 2014 and remained the number one security concern due to its ruthless violence, financial resources, and innovative methods for utilizing social media (Mabon and Stephen 2017). Much UN attention is focused on Mosul following the takeback of the city from ISIS and the level of human rights abuses there becoming evident. In May, the UN refugee agency opened a 12th camp outside of Mosul in order to address the increasing numbers of displaced persons as the prior camp, which is able to house 30,000 people, was full (Gluck 2017). Families that are arriving at the camps report that the situation in Mosul is worsening, with no water, food, fuel, or basic services. Additionally, travelling out of the city in an attempt to reach a camp is a dangerous journey. The situation in Iraq caused by ISIS is a security concern in several different areas: infrastructure has been destroyed by brutal fighting, hundreds of thousands of people are displaced, and ISIS brutality will have lingering impacts on the people of Iraq. Funding for humanitarian efforts is nowhere near the level it needs to be, with only 17 percent of the $985 million requested by the Humanitarian Response Plan for Iraq coming to fruition (Abdulla 2017). The lack of funding from the international community has the potential to endanger the ability of the UN to properly address the humanitarian crisis which would not help to mitigate security concerns. On top of the necessary basic goods that the UN provides, they are also building field hospitals to assist with victims of trauma (Abdulla 2017). These field hospitals are providing essential services that are necessary for the people of Iraq to have access to after experiencing such high levels of trauma and violence at the hands of ISIS. During a trip to Baghdad in March 2017, UN Secretary General António Guterres pledged to continue the commitment of supplying aid and assisting in rebuilding Iraqi institutions and reiterated the importance that ISIS is held accountable for their human rights abuses – though he was unclear about the role the UN will have in that process (UN News 2017). Even though ISIS appears to have been defeated in Iraq, there is still an ample amount of work for the UN to do in order to help bring security back to the region. Addressing medical needs and providing the citizens methods to deal with the trauma they experienced is a necessary step in bringing security back to the region. Rebuilding infrastructure and political institutions will lead to a stabilization that will also help to increase the level of security. Marta Ruedas, UNDP Resident Representative for Iraq, has pointed out that roads in Iraq are being repaired, hospitals are becoming operational, electricity is being restored, and people are finally able to return to work (United Nations Iraq 2018). She also stated that more than 60 percent of the nearly 6 million displaced people have been able to return home. These are all steps in the right direction, but there is still a large amount that needs to be done before Iraq is once again stable. The international community has a responsibility to provide the necessary aid to the UN to ensure that future stabilization is possible. The conflict in Syria that erupted in 2011 has compromised security in the entire country and displaced millions of Syrians. Human rights violations have occurred on large scales during the Syrian crisis and the UN has responded by calling for an “immediate end to violence, the release of political prisoners, impartial investigations to end impunity, ensure accountability and bring perpetrators to justice, and reparations for the victims” (UN News Centre n.d.). Each of these steps are critical in the attempt to restore security to Syria. Since the conflict began, Syria has gone from a middle-income country to one in which four out of five residents live in poverty (UN News Centre n.d.). The displacement of Syrians has also strained the economies of neighboring countries as they attempt to house increasing numbers of Syrian refugees. This also creates an external security concern for these neighboring countries as their own development is being challenged by absorbing large numbers of people that infrastructure and economies are not always equipped to do. The UN addresses this security concern by working to build bridges between humanitarian and development responses to the crisis by supporting increasing the resilience of the most affected communities in both Syria and host countries. They do this by strengthening livelihoods, fostering social cohesion, and rebuilding infrastructure (UN News Centre n.d.). In December 2014, the UN launched the Regional Refugee and Resilience Plan (3RP) to address the growing concerns in Syria. The 2016–2017 initiative for the 3RP is a combined effort of the UN and more than 200 partners with goals that are not limited to the confines of the Syrian border. Examples of what the 3RP aims to accomplish is creating strong national leadership regarding response planning through the Lebanon Crisis Response Plan, Jordan Response Plan, and 3RP chapters in Turkey, Iraq, and Egypt (3RP Regional Strategic Overview n.d.). It also aims to provide a regional protection framework as well as promote education for young people. One of the most important aspects of security that the 3RP addresses in countries absorbing Syrian refugees is food security – a basic human right that is necessary to be met before other concerns can start to be addressed. In January 2017, rebel groups and the Syrian government delegation attended talks that were held in Astana, Kazakhstan. This meeting – also attended by Russia, Turkey, Iran, and the UN Special Envoy for Syria – resulted in an agreement of a ceasefire in Syria among the three sponsor countries. In February and March 2017, the Special Envoy convened parties to Geneva for talks that focused on Syria. The topics that were discussed regarded governance, drafting a new constitution, holding elections, and counter-terrorism strategies. These talks continued periodically, either occurring in Geneva or Astana, until the fourth round of Astana talks in early May 2017. The result of the fourth round of Astana talks was the signing of an agreement to create four “de-escalation” zones in Syria, of which the UN Special Envoy stated was a step in a promising direction (UNOG n.d.). As is evident, the security situation in Syria crosses borders and creates a unique challenge for UN involvement. There are multiple actors that must agree on peace processes while being held accountable for any questionable actions or violations. The UN is involved in the Syrian peace process both by being involved with talks and also by addressing the needs of refugees in both Syria and in host countries. Currently, there are no UN peacekeepers present in Syria. A continuous issue facing UN involvement with Syrian refugees is funding, as is evident by a significant shortfall in a joint UN–EU conference in April 2018. This conference, held in Brussels, had a target of raising $9 billion and ultimately raised only $4 billion. This lack of funding undoubtedly means that some essential UN programs will have to be cut. These funds are also not part of any reconstruction initiatives in Syria, something EU Foreign Affairs Chief Federica Mogherini said would only begin once a peace agreement was in place (Wintour 2018). Funding is necessary for both those in Syria and refugees in countries bordering Syria where tensions are increasing – and at risk of spiraling out of control in places such as Lebanon. What is most evident regarding the relationship between the UN and Syrian refugees is that there will continue to be a desperate need for funding to ensure basic levels of dignity are possible and to ensure basic needs are met. The UN was aware of what was unfolding in Yemen and actively sought to prevent conflict. In February 2015, the UN Security Council demanded Houthi rebels to “immediately and unconditionally” withdraw from all government institutions, release President Hadi, and engage in UN brokered negotiations to work towards democratic transition (United Nations 2015). In March, the Security Council met to address the ongoing crisis. At this meeting, Jamal Benomar, Special Adviser of the Secretary-General on Yemen, expressed his growing concern regarding the growing discontent in Yemen. He stated that he believed the events preceding the meeting were leading Yemen away from peaceful settlement and towards a civil war. Benomar gave detailed accounts during this meeting regarding what was happening on the ground in Yemen. The most notable events were heavy clashes on 19 March between the Central Security Forces and popular committees and bombings that occurred on 20 March in Sana’a, which killed as many as 140 people. He also reported that on 21 and 22 March, Houthi militia and units of the Yemeni army gained control of Taiz, which held geographical significance as the gateway into Aden (Security Council 2015). The Security Council met again on 14 April to discuss the importance of addressing the escalating situation in Yemen. Topics discussed in this meeting were the emphasis on the potential humanitarian crisis, the importance of human security and human rights, and the issue of Saudi Arabian involvement in the crisis. The Security Council acknowledged that President Hadi had requested the aid of Saudi Arabia, by any means necessary including military-intervention, which is ultimately what happened (Security Council 2015). This series of events provides a framework for understanding what caused Yemen to become engulfed in a brutal war. It also creates an understanding for the challenges faced by the UN and the Security Council when conflict arises. The Security Council could condemn actions taken by the Houthis and impose sanctions, but the effectiveness of that was limited. At this point, the Houthis were not interested in engaging in democratic peace talks and they did not recognize the legitimacy of President Hadi. Yemen is one of the greatest security risks in the international community for a multitude of reasons. An estimated 8.3 million people are dependent on external food aid, while 400,000 children are suffering from severe acute malnutrition. Virtually all Yemeni children are in desperate need of humanitarian assistance, which is exemplified by the fact that UNICEF estimates show that 25,000 Yemeni babies have died at birth or before reaching one month (Nehebay 2018). On top of severe food shortages, there are shortages of medical supplies. A diphtheria outbreak quickly spread beginning in December 2017 within areas of Yemen, with nearly 700 cases and 48 associated deaths (Nehebay 2018). Cholera has also been a significant issue in Yemen, with over 1 million cases beginning in early 2017 that have resulted in 2,300 deaths (Yemen Cholera Response 2018). Less than 50% of hospitals across Yemen are operational, 18% of districts have no doctors, and 56% of the population has no regular access to basic healthcare (UN News 2018). There are currently no UN Peacekeeping forces in Yemen to help ensure that millions of vulnerable people are protected and provided with the aid that they urgently need. The United Nations Development Programme (UNDP) has identified and subsequently constructed a method for addressing some immediate humanitarian concerns, thus hoping to alleviate some of the overall security concerns that this conflict has created. The UNDP is approaching their operations in Yemen from a community-based viewpoint and aims to create programs that will increase the level of resilience. In partnership with the World Bank and USAID, the UNDP has addressed primary needs in 300 out of 333 districts in almost every governorate (Yemen, 2017). One example of an initiative taken on by the UNDP is the creation of Cash for Work (CfW) projects, of which 25,700 people registered for with the result of 12,000 being chosen (Yemen 2017). In 2016, 261 young women were trained as community health or nutrition workers while 800 farmers were identified and financed (Yemen 2017). These programs, along with several others, are conducted in order to encourage economic self-reliance and resilience. There is also work being done by the UNDP that aims to increase peace-building and governance. These projects or activities are largely funded by individual countries across the world. An example of this is the UNDP NGO Capacity Building Project which trained 66 NGOs on techniques to handle conflict sensitive approaches to providing humanitarian assistance. Several of these were awarded grants in specific governorates which allowed for them to become trusted partners for both the government of Yemen and the international community. There were also efforts to address the human rights violations that have been occurring in Yemen and to provide psychological support to hundreds of victims (Yemen 2017). In January 2017, the UN Special Envoy for Yemen arrived in Aden to meet with key stakeholders in the ongoing conflict. The focus of the meetings was both to renew the cessation of hostilities and to address the increasing humanitarian crisis. The Special Envoy then spent two days in Sana’a to focus on security plans for peace agreements and the need to lift restrictions on civilian aircraft to and from the Sana’a airport (OSESGY 2017). In April 2017, $1.1 billion for aid to Yemen was pledged at a UN conference in Geneva (al-Saeed 2017). However, the situation in Yemen has since worsened. The UN has attempted to address mounting concerns of famine and disease, but the implementation of humanitarian aid is not easily accomplished. In early May 2017, senior UN relief official Jamie McGoldrick called upon all parties involved in the conflict to allow for unrestricted access to citizens across the country (al-Saeed 2017). One of the top concerns and priorities is the allowance of medical supplies and medicine. There have been delays at ports, checkpoints, and interference with other aid delivery that have prevented critical supplies from reaching their destinations (al-Saeed 2017). Yemen is the greatest concern for human security within the Middle East. If the situation in Yemen does not improve, an additional 10 million people will become food insecure by the end of this year (UN News 2018). While the UN does not provide peacekeepers to aid in mitigating conflict, it does provide essential services for promoting peace building that leads to a higher level of human security. The challenge for the UN in Yemen is getting all parties involved to cooperate for the benefit of the civilians, or the most vulnerable population. This has consistently proven to be incredibly difficult, especially given direct Saudi military involvement in the conflict. The UN consistently attempts to provide essential humanitarian aid, build economic self-reliance and resilience, and implement vital social services that are necessary for the betterment of human security. In April 2017, the UN Special Coordinator for the Middle East Peace Process, Nickolay Mladenov, addressed the Security Council regarding the fragile state of the Middle East. He stated that ‘a perfect storm has engulfed the Middle East and continues to threaten international peace and security’ (Romenzi 2017). Mladenov noted that the instability has paved the way for foreign intervention and manipulation which could ultimately create more instability. Most importantly, he also addressed explicitly that the situations taking place in the Middle East create social exclusion or marginalized populations, which both can provide grounds for an increase of violent extremism. The UN recognizes that there needs to be unity across every ethnic and religious line to continue addressing the situation in the Middle East. The conflicts currently facing the Middle East have created the largest refugee crisis since the Second World War and this population of vulnerable people create a difficult challenge for neighboring countries attempting to aid them (Romenzi 2017). The level of human suffering in the Middle East increases the concern over security in a multitude of ways, such as the exploitation of vulnerable populations or the lack of resources being provided to address basic health care and trauma. The UN needs the continuing support of the international community in order to continue their humanitarian and protective missions in the Middle East. Failing to garner the support of the international community could prove to be detrimental to the security of the Middle East in the coming years. The UN will need to remain in the Middle East for the foreseeable future. With the presence of ISIS winding down, the war in Yemen, increasing conflict between Israelis and Palestinians and other regional issues the UN is able to fill the role of a moderating third party. The UN is also providing critical support to the people in areas that are subject to degrading and dehumanizing conditions every day. However, as an institution of global governance, the UN cannot continue operating at its current capacity in the Middle East without unwavering support of the international community. If anything, key actors that are involved with the Middle East should be doing more to support UN efforts, be it financially or by other means. As time progresses the UN should attempt to involve regional actors, such as the Arab League, more often in attempt to decrease their role in governance. The Arab League has been involved, but it appears as though this involvement has been limited. Given that the Arab League is a prominent regional organization in the Middle East, they need to be given a more active platform and presence with the UN. Doing so is necessary to both create and promote any possibilities for peace and stability. n.d. 3RP Regional Strategic Overview. http://www.3rpsyriacrisis.org/wp-content/uploads/2015/12/3RP-Regional-Overview-2016-2017.pdf. Abdulla, Ivan. 2017. UN News. April 26. http://www.un.org/apps/news/story.asp?NewsID=56631#.WRng0WgrLIU. Coker, Margaret, and Falih Hassan. 2017. “The New York Times.” Iraq Prime Minister Declares Victory Over ISIS. Dec 9. https://www.nytimes.com/2017/12/09/world/middleeast/iraq-isis-haider-al-abadi.html. Delpech, Therese. 2006. Iran and the Bomb. Paris: Editions Autrement. Gama, C. F. (2009). 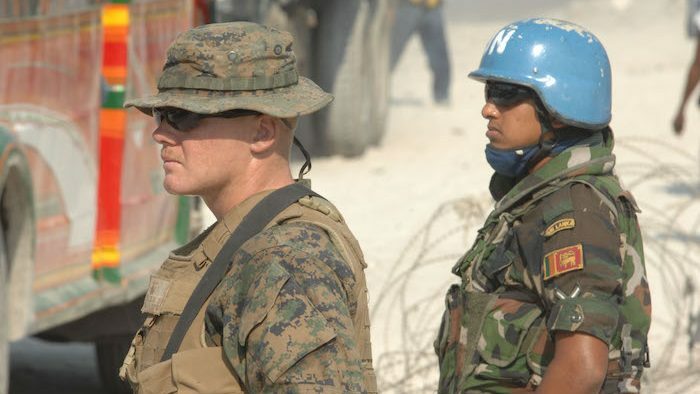 Bridge Over Troubled Waters: United Nations, Peace Operations and Human Security. Journal of Human Security, 9-31. Gluck, Caroline. 2017. UN News. May 12. https://news.un.org/en/story/2017/05/557202-iraq-un-refugee-agency-opens-twelfth-camp-displacement-escalates-west-mosul#.WRnguGgrLIU. Human Rights Watch. February 14. https://www.hrw.org/news/2017/02/14/lebanon-new-refugee-policy-step-forward. Hussain, Nazir, and Sannia Abdullah. 2015. “Iran Nuclear Deal: Implications for Regional Security.” Journal of Political Studies, 22 (2): 479–493. Khan, Saira. 2010. Iran and Nuclear Weapons: Protracted conflict and proliferation. New York: Routledge. Mabon, Simon, and Royle Stephen. 2017. The Origins of ISIS: The Collapse of Nations and Revolution in the Middle East. London: L.B. Tauris & Co Ltd.
Mehta, Rupal N., and Rachel Elizabeth Whitlark. 2016. “Unpacking the Iranian Nuclear Deal: Nuclear Latency and US Foreign Policy.” The Washington Quarterly, 39 (4): 45–61. Mohammed, Arshad. 2017. US lawmakers aim to comply with Iran nuclear deal: EU. November 7. http://www.reuters.com/article/us-iran-nuclear-mogherini/u-s-lawmakers-aim-to-comply-with-iran-nuclear-deal-eu-idUSKBN1D72AY. Orkaby, A. (2017). Yemen’s Humanitarian Nightmare: The Real Roots of the Conflict. Foreign Affairs, 96(6), 93–101. Pokharel, Tilak. 2016. UNIFIL. Oct 3. https://unifil.unmissions.org/lebanese-soldiers-join-un-peacekeepers-peace-relay-march. Roehrlich, Elisabeth. 2016. “The Cold War, the developing world, and the creation of the International Atomic Energy Agency.” Cold War History 16 (2): 195-212. Romenzi, Alessio. 2017. UN News. April 20. https://news.un.org/en/story/2017/04/555662-middle-east-engulfed-perfect-storm-one-threatens-international-peace-warns-un#.WR-OCGgrLIU. Samore, Gary. 2015. The Iran Nuclear Deal: A Definitive Guide. Belfer Center for Science and International Affairs, Harvard Kennedy School, Cambridge: President and Fellows of Harvard College. 2017. Tripartite. April 20. https://unifil.unmissions.org/unifil-head-chairs-regular-tripartite-meeting-laf-and-idf-officials. UN News. March 2. http://www.un.org/apps/news/story.asp?NewsID=56272#.WR9-DWgrLIU. UN News. March 30. http://www.un.org/apps/news/story.asp?NewsID=56465#.WRnvo2grLIU. UN News. May 21. http://www.un.org/apps/news/story.asp?NewsID=54007#.WjvKxd-nHIU. “UN News.” Security Council calls for calm following deadly Gaza clashes; diplomats debate US embassy move. May 15. https://news.un.org/en/story/2018/05/1009792. n.d. UN News Centre. http://www.un.org/apps/news/infocusRel.asp?infocusID=146. n.d. UNIFIL Civil Interaction. https://unifil.unmissions.org/unifil-civil-interaction. n.d. UNIFIL Fact Sheet. https://peacekeeping.un.org/en/mission/unifil. United Nations Development Programme. 2017. “UNDP Results Yemen.” April. http://www.ye.undp.org/content/yemen/en/home/library/general/results-2016.html. n.d. United Nations Iraq. http://www.uniraq.com/index.php?option=com_k2&view=item&layout=item&id=943&Itemid=637&lang=en. “United Nations Iraq.” 2018. Australia substantially increases support to stabilization in Iraq. May 11. http://www.uniraq.org/index.php?option=com_k2&view=item&id=9055:australia-substantially-increases-support-to-stabilization-in-iraq&Itemid=605&lang=en. Weiss, T. G. (2016). What’s Wrong with the United Nations and How to Fix It. Cambridge: Polity Press. Wintour, Patrick. 2018. “The Guardian.” Donor conference for Syrian refugees falls $5bn short of UN target. April 25. https://www.theguardian.com/world/2018/apr/25/un-eu-conference-syrian-aid. Allison Miller is a PhD Candidate in Globalization and Governance at the School for Public and International Affairs (SPIA), Virginia Polytechnic Institute & State University, USA.